Looking at the barns from the north pasture. Woke up to puddles and 37 degrees. By afternoon it reached 54, so the dogs and I took a walk down the lane and around the pastures. Hundreds of geese were in the corn fields that are partially flooded, but they were not bothered by us and went about their business as if we were invisible. The ditches are so full of water, it is flowing from one side of the lane to the other. The grey sky does not keep the reflections from being spectacular. Needless to say, the dogs had to have their legs and feet washed when we got home. Those of you who have horses (and love them), at one time or another are going to fall off, get thrown or stepped on. What do you do when this happens? As the old saying goes, "you have to get back on!" People end up on the ground for different reasons: the horse might spook, crow hop and you go over their shoulder. Maybe they buck when you don't expect it.... Even if you have the sweetest horse in the whole world, you always have to be prepared to keep accidents down to a minimum. They can read you like a book. If you are scared, they know it before you do and may react to your energy. The more you experience, the more experienced you become. Working with horses is not always like the movies and Disney's old "Spin and Marty" series. You need information. The best way to get it, is to hang around with some respected horse people...go to clinics...read. A horse is a very big animal with the ability to do anything it wants. You have to figure out how to communicate with each other in a way that is SAFE and mutually beneficial. Have you ever heard anyone say that animals reflect their owners??? (they do in my experience). If you are nervous or scared, they feel it...if you are relaxed, they are. Breathing is always good. Today a young rider came to use our Indoor Arena. 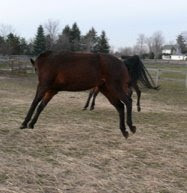 When she lost her stirrups at what started out as a nice relaxed canter, she panicked. Her horse felt it...the rider lost her balance and fell over the horses shoulder. She was bruised and scared. Sad but true, this comes with the territory. It is hard to find a horseperson who has never fallen off. In this case, the horse is as kind and giving as they come...she is well suited to the rider. Under protest, the rider got back on and walked around the arena with her father at the horse's head. I hope they return soon so the confidence level can return to what it was. Working with and riding horses is a serious proposition that you can't take lightly. If you love your animals, you need to invest in them...that takes a lot of time and effort. PS... I found out tonight, that this young rider broke her arm. I hope the love of her horse and riding will get her back in the saddle when it heals...she has a great position, good hands and a very special mare. Just enough water to go for a swim. The weatherman said nights in the teens have come to an end, and we can look forward to the fifties tomorrow, reaching sixty on Tuesday. If he is right, we are in for a pleasant change. Since I started photographing sunrises, we have had more sunny days than I can remember (for this time of the year)....now, to have the snow disappear would make me very happy. More than high temperatures, I prefer having the ground dry out enough to eliminate a lot of mud in the pastures and paddock. The grass has a chance to grow. This is good. The golden oldies are still clear eyed and bushy tailed. Today I helped Jenny with the boys while she did some shopping. When we got back to her house and moved some packages into my car, the door was left open and who jumped in? Ice. I think he was trying to tell me something! (I wrote about him earlier, and how he arrived in Brockport). We decided that he could come up to the farm for some play time with Josh and Phoebe. He gets a little lonely since Jaxi died. AND IT'S ONLY THE FIRST FULL DAY! Do you remember this yucca? THE SUN DID COME OUT "TOMORROW"